When describing styles of yoga, Hatha yoga is a popular term – but what does it really mean? Often, not what some might think. At triyoga, we don’t call any of our classes Hatha yoga but many of them are rooted in Hatha yoga practices. 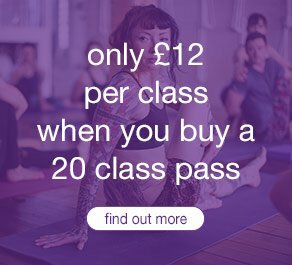 These include popular styles such as Ashtanga, Vinyasa, Kundalini and Iyengar yoga, as well as our open level yoga and yoga gently classes, to name a few. The phrase Hatha yoga first appeared in ancient Indian texts around the end of the first millennium and became formalised into a system around the 13th Century. Patanjali and Tantric yoga influenced early Hatha yoga, even as we saw a whole new range of practices introduced, including standing postures, breath control practices and mudras, or hand gestures. Hatha in Sanskrit means force, which might surprise you because many people think a hatha yoga class is a gentle one. That doesn’t mean it was a particularly aggressive or vigorous practice in the traditional Indian context – although there are plenty of examples of yogis performing extreme austerities like holding an arm raised for years at a time or sitting amid fire pits on a burning hot day. Over time, the concept of Hatha yoga changed and in the 15th century it was said to balance solar (ha) and lunar (tha) energies. Generally, Hatha yoga has walked the middle road. Western ideas and practices contributed to its radical transformation in the 20th and 21st Centuries and the myriad of styles that appear in yoga studios across the world. Classes are divided into styles of yoga, but also levels. Check with your teacher before moving up a level and always inform your teacher if you are pregnant or have any injuries. Open to all levels from beginners to more experienced. The teacher adapts the class according to the students. Open to complete beginners, those in the initial stages of yoga practice or those seeking a gentler asana practice. You will learn the fundamentals of yoga. Builds on the foundational blocks that are established in a Level 1 class. A working knowledge of yoga principles is expected. Works on deeper physical and psychological level. Introduces more sophisticated practices that may include more challenging postures (inversions, deeper backbends) as well as pranayama, mudra and meditation. Not suitable for beginners. Teaches more difficult postures and breathing techniques. Assumes an understanding of the gross as well as subtle aspects of practice. A challenging class for the experienced student who possesses deep awareness on both a physical and mental level. Definitely not for the faint-hearted.